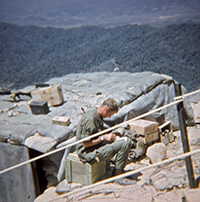 Firebases were reference points in an Infantryman's Viet Nam tour. Their primary purpose was to provide artillery fire in support of infantry combat operations. 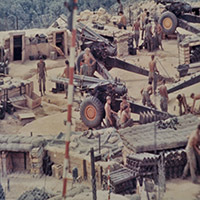 Since the artillery and signal personnel on the firebase could not defend "the hill," infantry companies rotated turns in providing firebase security. 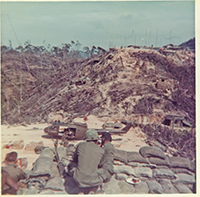 Since there were four rifle companies in the battalion, about a fourth of the time was spent "pulling security" on a firebase. The chart below lists the name of a firebase or a grid location such as 3527. 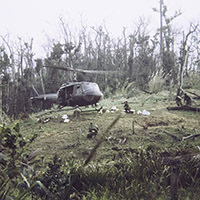 The grid location refers to the local tactical map but generally the company would be within 10-20 kilometers of the battalion firebase. This table provides geo coordinates as well as the military grid. Select a set of geo coordinates and paste them into google maps. You can also select the 3D mode in google maps to get a sense of the location's relation to the surrounding terrain.